This data set can be used to identify the extents/ boundaries of geographic features and unincorporated places that have been officially named or which are being considered for official naming. This data set also contains geographical referencing information (type of feature or place, location coordinates, geographic township, municipal and map references) about these features and places and background information behind their official naming (name status, naming date, name origin, naming history, etc). Please note that all Geographic Name Extents have yet to be defined and that alignment of the Geographic Name Extent layer with other hydrographic layers is on going. Supplementary tables (including a look-up table) can be used and are available for download from the additional documentation section. Supplementary look-up table descriptions are available in the data description document, which is available for download from the additional documentation section. This layer is part of what was known as the OMNR Non-Fundamental Dataset. Created for the use of government ministries and agencies, GIS developers, map-makers, publishers and any other persons engaged in the preparation of maps or other publications intended for official or public use. Legislated or Legal Authority for Collection: Ontario Geographic Names Board Act. This layer used to be distributed under the name Geographic Name Extent but was modified to Geograhpic Named Extent in November 2011. More more information, please refer to the technical bulletin in the additional documentation section. Horizontal: Reliable: +/- 10 m; Vertical: Reliable: +/- 5 m.
National Topographic Series Maps (NTS): Map and Paper File (1:50,000 and 1:250,000). 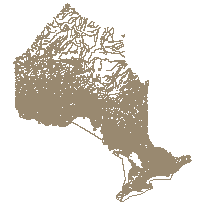 Ontario Basic Map (OBM): Map and Paper File (1:10,000 and 1:20,000). Ontario Geographic Names Board Record (OGNB Record): Field and correspondence files. Field information on cards, maps, logs and audio tapes. Correspondence files of mail-out survey results related to official naming submissions. Geoname FRI base and Geoname Card Index (FRI): Map and card file. Integrated map and card file system outlining information on the extents of officially named features and places taken from Ontario Geographic Names Board decisions and decisions of previous National naming Boards.